A nutritionist is a professional who dispenses clinical advice and help over the food intake and its impact on health. They advise clients the best diet to consume based on the clients’ needs. They teach the clients about the properties of different nutrients and the foods that are beneficial for them. These are then supervised according to the needs of the clients. They can also design diet regimen specific to the client’s needs. Below are the 5 most popular Nutritionists in Islamabad based on internet search by users in Islamabad. Dr Nosheen Abbas is a leading nutritionist in Islamabad. She is a highly qualified professional and has an experience of 12 years. She holds the degrees of MBBS, MSPH and SNHS Dip. (Holistic Nutrition) from the UK. Moreover, she is also a member of PMDC (Pakistan Medical and Dental Council). She has a wide variety of specializations, including Antenatal diet, cholesterol management diet, weight gain and loss diets, and hormone disorders. She also treats food intolerance issues and gluten allergies. Dr Nosheen also dispenses advice to pregnant women. She is currently practising at Islamabad Specialists Clinic. Ms. Samia Ali is a highly competent nutritionist. She also is a certified Dietitian therefore is qualified to design diet regimen to promote health and treat diseases. She holds an experience of 10 years in this field. Ms. Samia Ali is also a member of Pakistan Nutrition and Dietetic Society. She is presently working at Clinics and Diagnostic Hospital, Islamabad. With an experience of 10 years, Dr Sumaira Nasim is one of the top nutritionists in Pakistan. She holds degrees of MSc and Ph.D as well. Alongside general practice, she also has teaching experience. She has been affiliated with reputable institutes like Aga Khan University Hospital in the past. She is also a Nutritionist of Sehatyab Online Clinic. Dr Nasim is also a member of the Pakistan Nutrition and Dietetic Society (PNDS). Furthermore, she was also a member of the executive committee of PNDS and member of the Nutrition Society, UK. She has a variety of nutrition specializations, including diabetes, heart diseases, kidney diseases, counselling for weight loss. Moreover, she also treats food allergies and hypertension. She is currently practicing at Dr. Sumaira Clinic in Bahria Town, and Korang Town. Sara Ayub is a leading nutritionist in Islamabad. She holds a degree of MSc in this field. She is one of the most sought-after nutrition experts in the city. She guides her patients with research backed medical advise that is comprehensive and effective. She is currently practising in Islamabad Specialists Clinic. An extremely competent nutritionist, Hina Ashraf is one of the top experts in the field of nutrition. She holds a Masters degree in nutrition. Furthermore, she is also a certified dietitian, and so is able to treat illnesses and design a diet plan to be followed by the patients. Ms Hina Ashraf is also a member of Pakistan Nutrition and Dietetic Society (PNDS). She is available at Kulsum International Hospital, Islamabad. 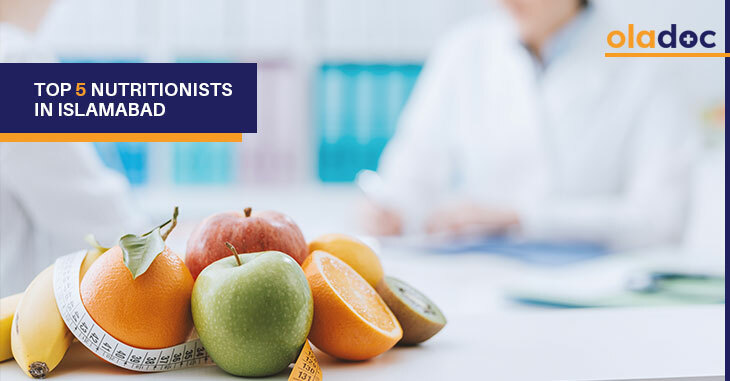 You can also book an appointment with other top Nutritionists in Islamabad, Lahore, Karachi through oladoc.com, or call our helpline at 042-3890-0939 for assistance to find the RIGHT professional for your concerns.